While marketing literature is largely concerned with optimal marketing techniques and strategies to maximize customer value and capture value in return, little focus is on potential shifts in marketing ahead. 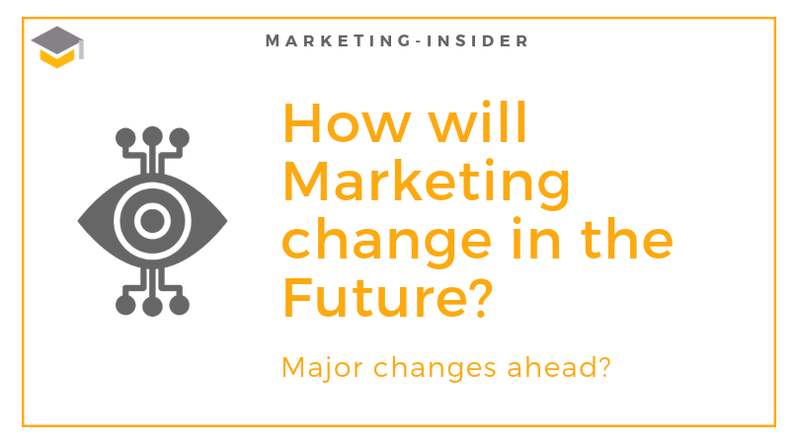 How will marketing change in the future? Are there major changes awaiting us for which we should prepare? The one factor that continues to shape the future of marketing is the customer. Despite potential changes in marketing, the customer will stay in the center of all strategies and efforts. However, consumer needs are changing everyday and continually become more sophisticated. When seeking an answer to the question how will marketing change in the future, this is certain: the consumer continues to be at the center, but consumer needs and expectations become more complex. The customer wants more information, assistance and support – fulfilling his increasingly sophisticated needs and expectations. For that reason, there will likely be a stronger focus on customer service in the future. Assisting the customer in any way and accompanying him over the complete lifecycle is more important than ever. Instead of a single sale, a customer experience is aimed to be sold to the customer. Keeping the customer for a longer period than just one purchase is increasingly focused on. In order to bind the customer to the firm over the complete lifecycle, it is crucial to understand what the customer wants and how needs evolve. Advancements in technology help marketers to better understand the consumer journey. Many people panicked when they returned to Facebook to see an ad on just what they had been searching for in Google, but technological advancements like this are only a part of what we may expect for the future. Artificial Intelligence is already in play, however, it will get much stronger. Using AI, customer engagement and service will increasingly be automated to assist individual customers at any time. Answering how will marketing change in the future certainly involves thinking about communication. With advances in AI, also the manner in which people receive assistance will evolve. People now use their phones and devices to type in what they want and what they want to do. With the introduction of Siri, Google Assistant, and Amazon Echo, we have seen how easy it can become to seek support. Clearly, this was only a first step – we will see it everywhere and in a much more advanced way in the future. This introduces a completely new way of communication, and promises a strong marketing channel to reach out to consumers and engage in multidirectional communication.